Professor Joe Keane, St James’s Hospital, Dublin is the recipient of the Irish Thoracic Society Research Grant 2016, awarded under the MRCG/HRB Joint Funding Scheme and supported by GSK through an unrestricted educational grant. The title of the research project is “Toward host-directed therapies to overcome impairment in cigarette smokers during mycobacterial infection”. 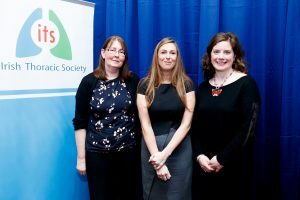 Pictured at the announcement of the award by Dr Jackie Rendall, President of the Irish Thoracic Society are Dr Mary O’Sullivan and Dr Seonadh O’Leary, both of Trinity College Dublin, members of the research team.